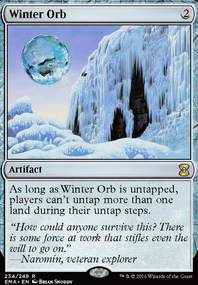 How would Winter Orb and Hokori, Dust Drinker work together? 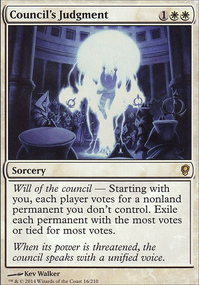 Could one sacrifice Hokori, Dust Drinker after an opponent's un-tap step but prior to his or her upkeep so that ALL of their lands remain tapped? 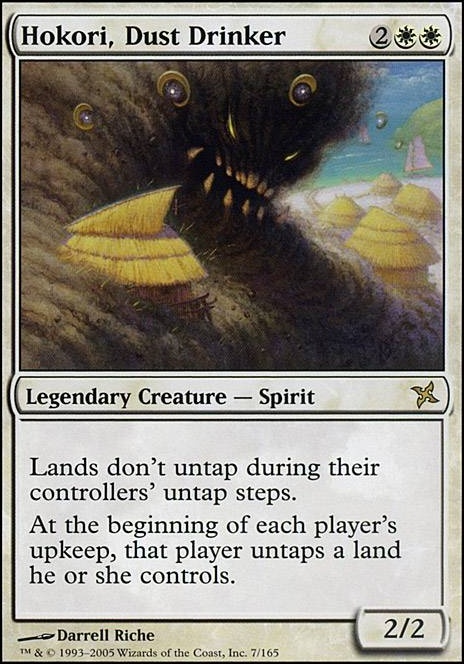 Lands don't untap during their controllers' untap steps. At the beginning of each player's upkeep, that player untaps a land he or she controls. Nice brew, neat idea to counter those clunky and annoying Vannifars! As smne who played Mono-W Stax for a while, with the amazing Hokori, Dust Drinker at the helm, I'll share with you what thoughts inspire me your sweet Linvala decklist. Let's start by the beginning: mana fixation. Extraplanar Lens is insane in every monocolored archetype, so it's a quite logic inclusion you made here. Nonetheless, I suggest you to go for Snow-covered lands to synergize better with it - that way you won't give a lift to your opponents playing white. Pearl Medallion and Sol Ring are basics, nothing really worth to say about it. Thran Dynamo and Worn Powerstone are more debatable. I don't know what is your budget issue, but if you want a competitve list, Mana Crypt , Mana Vault , Grim Monolith , Mind Stone , Everflowing Chalice etc. are all better options. Dynamo and Powerstone aren't bad cards, but they just come after those ones if you really do need a solid ''ramp'' package. Opal Palace feels badly slow and ineffective in a monocolored stax deck. You won't win the game by taking up the board with your creatures armed of a little +1/+1 counter. 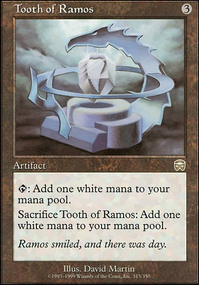 You have notable exclusions in your lands for a mono-white. Eiganjo Castle is the first card that comes through mind. Buried Ruin also is a recursive tool you should consider, even over Inventors' Fair . If you manage to find one, Ancient Tomb has its place there replacing Temple of the False God . At its final shape, my Hokori decklist was running a powerful Crucible of Worlds package including Wasteland , Strip Mine , Dust Bowl , Flagstones of Trokair , Lotus Vale and City of Traitors . I was up to 39 lands, not counting Maze of Ith . Now let's jump straight into your gameplan! So... you're planning to focus your eyes on ruining Vannifar's day. To help with this strategy of being the nasty ''combo killer'' guy, I think you should put in some additional pieces of disruption. That said, I don't know which Vannifar's version(s) your playgroup perform with. 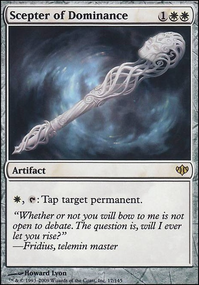 If it's a Thornbite Staff / Intruder Alarm one, things would be easier to calm down and you won't need such a heavy stax package - you'll need more single-target/multi-target removals though. 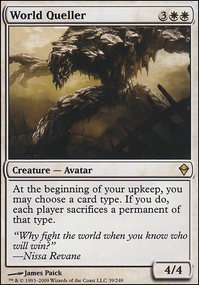 And if it's the other one, certainly the most popular now (and also the most powerful/absurd), based on many shenanigans around the creatures Vannifar brings to the table, you'll need more stax support. 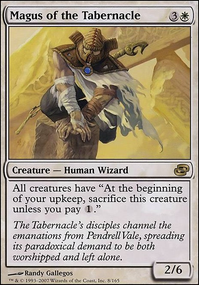 One of the very best cards you could add to stop all those creature-centered combos is Humility . This card is broken, this card is stupid. It even disables etb abilities. The only way your opponent has to go through is to destroy it with a creatureless source / or with a ''casting'' effect (like Ulamog has). Single-handly, Humility tears apart most of the competitive Vannifar lists. However, based on the fact that it is still fragile to enchantments/permanents removals, you'll have to build a defensive shield for your stuff. Vannifar lists often keep a strong package of cheap permanents' removals in their pocket (like Beast Within for example), so you'll need to play carefully. There's a lot of different ways you can head in order to reinforce your permanents' presence on the battlefield. 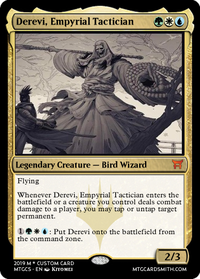 A pretty simple and most of the time effective, despite of its ccm, you already included is Avacyn, Angel of Hope . I think you still lack a way to cheat her casting cost out to make her a stable and destructive power house. Stax ''enchantment'' strategy is imo one of the most viable and solid strategy. With Academy Rector (amazing alongside your High Market ), you'll be able to search the exact piece you need to lock the game in your favor. Lodestone Golem > Considering all the artifacts you're playing, ~ seems like a consistent pick for your draft. Ethersworn Canonist > personal preference there. 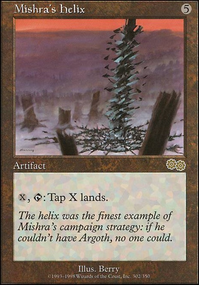 I always loved ~ in my stax deck. Synergizes well with Teshar. 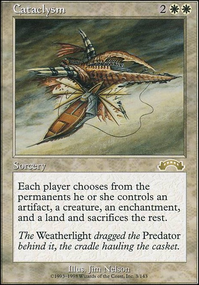 Phyrexian Revoker > another personal preference. Always found ~ useful. Pithing Needle > destroys Vannifar for 1 mana. Orb of Dreams > more of an Hokori all stars card, but could also be good here. Defense Grid > you run very little instants. This will disable control players ability to take advantage on the game. (Basically it's a second Grand Abolisher , harder to remove. Conqueror's Flail > another Grand Abolisher like. Platinum Angel > slow down combos, create a premium target for every combo player removals. Martyr's Bond > Slow and unreliable on this brew. As you're not sacrificing any kind of permanent on your own, you'll struggle to get any value out of it outside of a lost political blast deflagrating when the game should already be over. Unless you add in some cards like World Queller , it defenitly doesn't deserve a slot imo. Norn's Annex > 4 life + 3 mana for a worse Ghostly Prison . And I wouldn't even play Ghostly Prison there. Bishop of Rebirth > a lot of people seems to give love to this card recently. However, I personally think it is just a bad inclusion. You spend 5 mana on a understated body and you have to wait a whole turn before getting value out of it IF you are in the researched scenario. There will be times where you have Boots or Greaves on board and this will be an insane mini-Sun Titan, but the situation is too rare to justify its presence. Sublime Archangel > No real interest here. 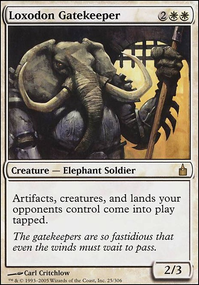 Good creature but doesn't provide anything for the stax strategy. Gift of Immortality / True Conviction > weird ''win con'' heavily situational cards based on creatures. There is some logic behind Gift, but it's just too much of a unreliable idea. True Conviction has nothing to do here... it's 6 mana spend to lose the control on the game. If you're searching for card advantage and a bit of healing, go for the brand new Dawn of Hope (also is a good mana sink). Rout > There are plenty better aoe in W. Wrath of God , Sunscour , Fumigate , Day of Judgment , End Hostilities , etc. If you want the instant option, just run Vedalken Orrery . Blackblade Reforged > intersting alternative win con. Feels slow nonetheless. Emeria Shepherd > too slow for my liking. 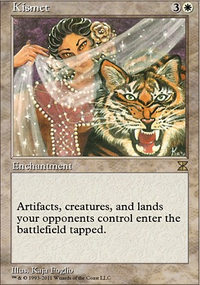 Whispersilk Cloak > can't understand what this does in a deck full of flyiers and tapping effects. Finally, as you want to challenge Vannifar, which is a blue deck, you'll need something to deal with the classical Cyclonic Rift . Teferi's Protection is a good solution (and it could also protects you form a lot of various situations / removals / etc. ), but I'm sure you can find a lot of other response. I hope you'll find useful ideas in this comment. Thanks a lot for sharing this, it reminds me good times. Keep up the good work, keep up brewing! Yeah I tought about Hokori, Dust Drinker but wasnt sure since it was creature VS cards like Rising Waters or even Back to Basics that are enchantments, much harder to remove. For both Magus thanks for the suggestion completely forgot about those! Finally for Counterspells, I wasnt there yet in my brewing but I will keep in mind those you mentionned! So I notice you're making stax in WU. 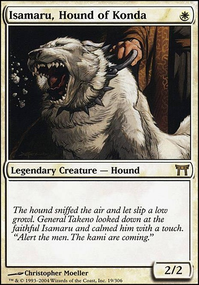 Maybe Hokori, Dust Drinker , Magus of the Moat and Magus of the Tabernacle ? 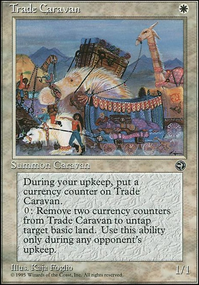 Also, since you're running Azorius, why not piss them off even more by adding in about 8 or so counter spells, like Render Silent , Cryptic Command (although this deck might be a bit mana starved for it) and other classics? Every Single card that was added recently saw play or got in my hand at some point and regarding most useless (even though explosive rarely) titania is redundant to what this deck tries to do, in this meta many two drops needing to be Stax is far more important and more likely to not lose you games! Hey, saw your forum topic. If you want to abuse tap/untap and disrupt your opponents with Derevi then consider expanding on the Stax/hatebear theme? 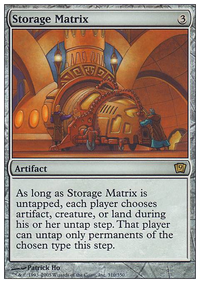 But like Bchong said if you're playing the Stax theme then you want to limit the amount of high CMC cards because you will not be able to consistently have enough mana to cast these cards. You say you don't have mana problems, but I find that hard to believe because there's a lack of ramp here with only 33 lands. There's no one mana dorks, only one two drop mana rock (Vessel) and no land ramp spells (Into the North, Farseek, Nature's Lore, Rampant Growth, etc.)? Mana dorks and land ramp are the main reasons to play green in Commander. If you're tapping down lands then consider adding mana dorks? Mana dorks are not effected by effects that tap lands therefore they can still make mana. 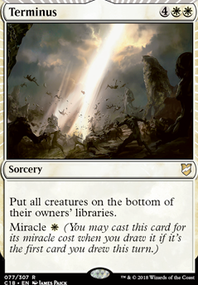 Other cards that are helpful when you can untap lands with Derevi/dorks are the enchant land ramp enchantments. Most mana dorks are one mana 1/1 creatures who can also attack when you have your opponents locked down. These dorks can attack, do combat damage to an opponent and be used to untap a permanent with Derevi. Edric, Spymaster of Trest and/or Nature's Will can make attacking with dorks or hatebears very beneficial. Consider Yisan, the Wanderer Bard or Birthing Pod? Both are very good with having the ability to untap a permanent with Derevi. They can give you a repeatable way to tutor for and put a creature right onto the battlefield, paying only one, two or three mana; this is helpful with the Stax/hatebear themes. As far as high CMC cards Sun Titan is one I suggest because he can reanimate a Stax/hatebear card especially good with Stasis or Tangle Wire. 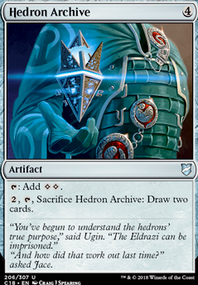 An equipment strategy is not good in Commander unless going all out playing Voltron with a ton of equipment, cards that care about equipment and cards that can protect your creatures while being equipped. My advice is cut the equipment strategy (Helm of Host, etc.) and focus more on expanding ramp and Stax/hatebear strategies. I will help you make cuts to add these cards if you like some of these ideas.